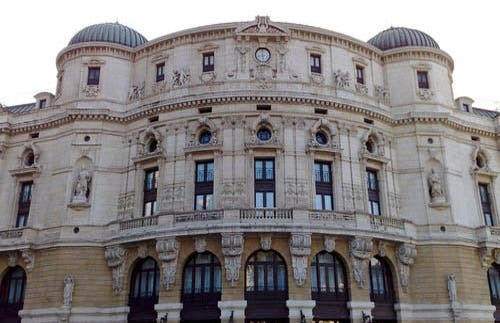 The Arriaga Theatre is in Plaza del Arenal in the center of Bilbao. In 1834, the first "theater of the Villa" opened built on municipal land in Arenal. 52 years later it was closed and demolished, and in the same place rose the new theater that opened in 1890. It was called the "New Theatre Bilbao". In the square where the theater stood a plaque was placed in memory of Juan Crisostomo de Arriaga, he was a musician who was called "the Spanish Mozart". The square is also called Plaza Arriaga and eventually people also started calling the theater "Teatro Arriaga". In 1902 this became the officially name.